At the end of the year 2012, the paper "Secure stadium experience" was introduced into German football. While this package of measures is into its second season now, we would like to see how our European neighbours handle the topic of security in football. For the start of this series, we took a look at Austria, Turkey and the Netherlands. In this text, we set our eyes on how things are in Sweden. The last years I have understood that there is a belief of Sweden as a country without violence at for example football matches. That is a completely wrong and misunderstood picture of Swedish football. During Allsvenskan (the Swedish top league) 2013 you could read words like “Here dies football” and so on on the first pages of the Swedish tabloids. Even if the supporters’ use of pyrotechnics – which is forbidden at Swedish stadiums – is a big problem, fights at the stadiums’ stands do occur. There are turmoil, pyrotechnics are thrown and games are interrupted. Often it happens before and during high-risk games where the most popular clubs such as Stockholm teams AIK, Djurgården and Hammarby (actually in the 2nd division) and also Malmö, IFK Göteborg and Helsingborg are participating. It is also these clubs that have the most known hooligan firms, persons that rather fight than watch good football. Matches between popular teams with a lot of supporters are always stamped as high-risk games by the media. For example at a rivalry match between IFK Göteborg and AIK there are a lot of spectators and you can feel the heat between the groups. Often you also notice a lot more policemen at this matches compared to matches between smaller clubs. In Sweden you can easily say that the clubs that have a lot of fans also have a lot of risk supporters. In Swedish football there is a rule that as soon as pyro is used the players return to their locker-rooms. Last season that happened so many times that I can’t even count the delayed and interrupted games on my fingers. When Allsvenskan 2013 was ended the work for a better season started, a season without problem both in- and outside the stadiums. Both the police and the government have appointed persons who will work for a better stadium- and supporter culture without violence. SFSU (Swedish football supporters’ union) unite the official supporter clubs of Swedish professional football clubs. It is though seldomly, or even not at all, these supporters that use violence. 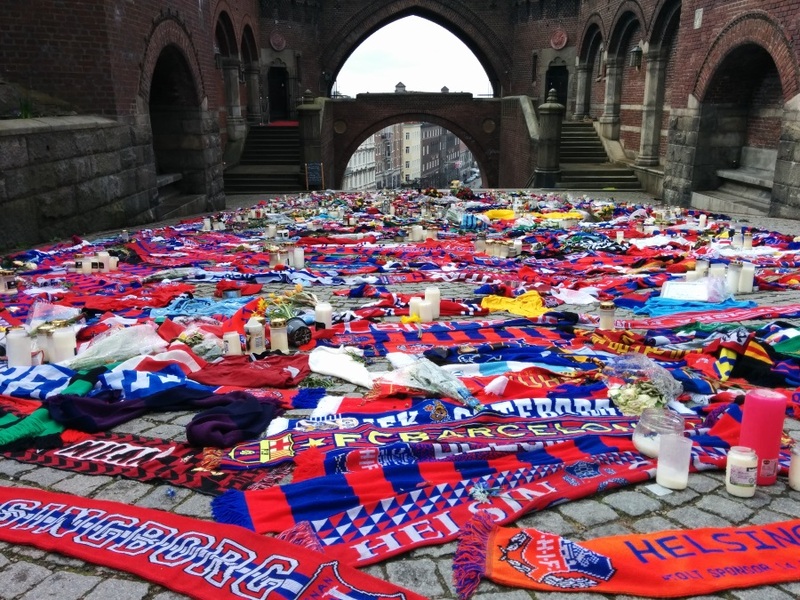 But when the 2014 season opening game between Helsingborg and Djurgården was about to begin, it became evident that the police and government’s effort were done for nothing. I don’t in any way want to blame them, but it was clear that their work was not enough. Until this season there had been one death due to football related violence. In the year of 2002 the IFK Göteborg hooligan Tony Deogan was abused to death by AIK hooligans in Stockholm. He was self a member of IFK Göteborgs firm. But then, at the 30th of March 2014, it happened again. The difference this time compared to 2002 was that the victim this time was a 43 year old man without connection to any firm, a dad of 4 children. He was just going to support his Djurgården in the opening game in Helsingborg. The man didn’t even reach the stadium. It all ended just above the well-known terrace stairs in Helsingborg. What really happened is still unknown because the judicial procedure against the suspect is still ongoing. But according to witnesses it was an unprovoked hit at the men’s head that caused his death. The suspect also has proven connection to a firm in Helsingborg. Despite the tragedy the match started. No one at the stadium knew what had happened just before the game. Of course they knew there had been fights downtown but not that a man had been killed. But at the score of 1-1, 30 minutes into the game, the rumour reached the Djurgården fans at the Olympia stadium in Helsingborg. It didn’t take long before a guy ran into the pitch with a lot of supporters following him. The word “Murderers, murderers, murderers” was chanted towards the Helsingborg fans. The game was interrupted and later it was decided to not continue the game. The result was no longer important. What should be added is that the night before the opening game there were several fights between supporters and hooligans in Helsingborg, and also attacks against innocent people. A restaurant was stormed by Djurgården hooligans and innocent habitants of Helsingborg were attacked with the restaurant’s drinking glasses, even with knives. The day before Djurgården’s ice hockey team had played an important game just 30 km north of Helsingborg, therefore at that time there were already a lot of Djurgården fans in Helsingborg. The town was described as a “barricaded town” that night. The opening day of Allsvenskan 2014 is probably the darkest day ever in Swedish football history. I can understand that in other countries there is an interpretation of Sweden as a peaceful country and not even I thought in my youth that so many people don’t hesitate to use violence. But now, since I’m living so close to the Swedish football and supporter culture, I have understood that just like in other countries there is always a group of people at the games which rather fight than watch their team win. I can attend a football game without the fear for other supporters or to be violated, but I do understand that there are some who can’t. For example parents who want to take their children with them to the games. In that way I’m impressed of the German football culture where I clearly see that there are bystanders of all ages. 80 year old women or parents with children are unfortunately a very rare type of spectators at Swedish football stadiums. Just the day after the tragically opening game in Helsingborg, a nine year old boy was hit by a flare at another game. Fortunately he wasn’t hurt badly, but it could have gone much worse. Even if most hooligans just find themselves fighting with other hooligans, mostly far from the stadium, it also happens closely to “normal” supporters. And with all the pyro at the stands there is always a risk that innocent spectators get hurt. From what I have mentioned above you probably understand that yes, the football violence exist in Sweden as well. The police, SvFF (the Swedish football federation), the clubs and the supporters do all have a lot of work to do for a better football culture in Sweden. The atmosphere at the stadiums is often fantastic and the different supporter groups are influenced by different supporter cultures, mostly the British and the Italian. The Stockholm derbies, the Skåne derbies and other big games deliver an amazing atmosphere in most cases, but tragically it is too often destroyed by incidents in- and outside the stadium. One of the biggest problems in Swedish football is the use of pyro. It’s forbidden but the supporters have learned to pass the guards and at the stands they are masked to avoid to get identified by the cameras. Just days after the premiere IFK Göteborg introduced prohibition of masking but that as well as the prohibition of pyro is just on paper and not obeyed by supporters at the stands. There have been discussions about only allow stands with seats but these were met with opposition from the supporter clubs and neither do I think that this would be the solution. Another idea is special sections where use of pyro shall be allowed. Maybe it will work but still it is an object that can be thrown either into the pitch or against someone at the stands. Beer stronger than 3,5% haven’t been permitted at the stadiums for a long time and doesn’t seem to solve all problems. Instead the supporters combine football and beer drink a lot more before the match. Also the police and stewards can’t just take the law with an iron hand and walk into the stands and arrest the persons who use pyro. The trust in the police is just as low among supporters in Sweden as in other countries and if the police step into the stands the atmosphere will be much worse. My own opinion is that the police show their power in an unnecessary way too often before and during the matches. When you’re traveling to a derby or to an important game, the supporters are louder. The difference between going to a home game contra an away game isn’t just that. As an away supporter you’re the underdog and therefore want to sing louder and “conquer the stadium”. The more fans the opponent have, the more space you need to take as an away supporter. But at the same time the police are ready and stricter about searching the supporters for flares and stuff like that. At the most away games the police travel with the fans of the away teams. Therefore you would think that the dialogue between the police and the supporters would be a lot better than it is. There has to be a discussion between the parts about if or how pyrotechnics shall be used at the stands and above all a solution to keep the rule breakers away from the stadiums. The violence is awful to watch and the police have described their operation during the premiere in Helsingborg as “a failure”, but at the beginning it is the “risk supporters” and the hooligans who are the problem. Those persons got to disappear from the stadiums. Suspensions may decrease the violence at the stadiums, though not help prevent the fights in the town or at the gravel yard 200 km away from the town where the match actually is played. Although it is hard to know where the boarders of “football related violence” shall be drawn. When does it turn from being football related to not being football related? No doubt the majority of football supporters in Sweden want to see a season without violence at or nearby the stands. The hit who caused the men's death before the opening game was a wakeup call for the police, the football federation, the clubs, the fans – everybody. It is just sad that it had to cost a life. No one want to see football without spectators, supporters or atmosphere regardless if it’s a match with 3 000 bystanders in Åtvidaberg or a Stockholm derby with an attendance of 30 000. The dream of a positive football culture is alive, but Swedish football has a lot of work to do. A lot more than people outside Sweden probably think.